See how well you know different topics and compare with friends. Tap on tiles that match the given clue. 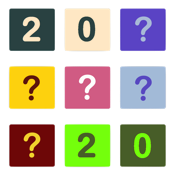 Get 20 correct taps before you tap 20 incorrect taps and you earn a score for the topic. Learn while you play with different topics such as Animals, Dogs, Cats, Flowers, and more. Share your ratings with friends on Twitter and Facebook.